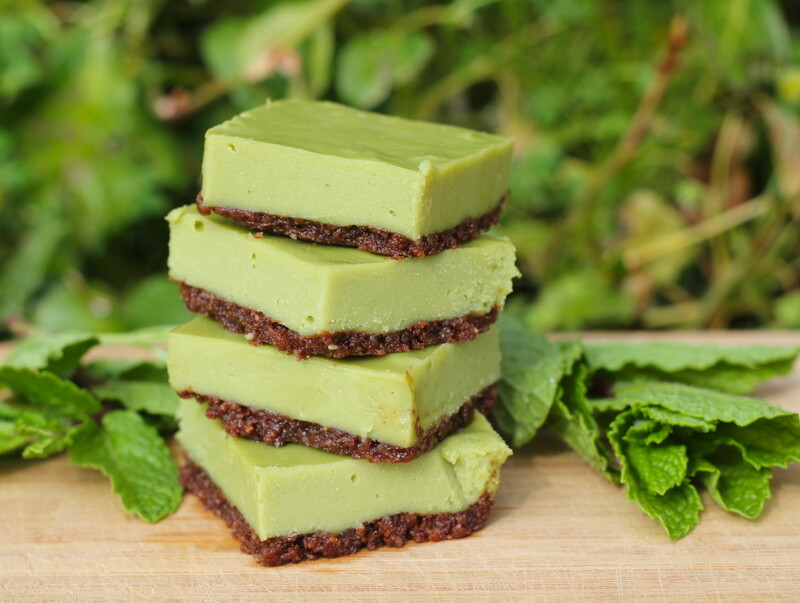 I’d love to share these healthy and green St. Patty’s Day dessert bars with you. So many things make this dessert unique and special! The filling is made with heart-healthy beauty foods cashews and cocoa butter instead of dairy. The bars are sweetened with maple syrup and dates, which are lower glycemic and in general healthier than other sugars (but it is still sugar, so enjoy in moderation)! But the #1 reason why I love these bars is because the festive green color comes from a natural and healthy source, not from a food coloring. Food coloring has been linked to so many problems: irritability, ADHD, cancer, and others. If you try cutting out or limiting “fake” food with dyes, you’ll be doing your body such a favor! I used Matcha Green Tea powder to make these bars green. This gives you a festive St. Patrick’s Day dessert without the potential side effects/health problems that come with food coloring, but also some added benefits! Matcha green tea is high in antioxidants that give us young skin and fight UV radiation. It also contains the catechin EGCg which is widely recognized for cancer fighting properties. If this were not enough, matcha green tea also enhances calmness, boosts memory and concentration, detoxifies the body, increases energy levels without typical stimulant side effects such as nervousness, can lower LDL cholesterol (bad) while increasing HDL cholesterol (good), and promotes overall health. So…which sounds better to you? I’ll pick matcha green tea over artificial dyes any day! If you’re not a fan of matcha or do not want the caffeine, there are other alternatives you can use to avoid the negative effect of artificial dyes. Some ideas that can make your dessert green include spinach (it has been done! ), spirulina, wheatgrass, green powder, avocados, and many others. Get creative! Use your desire for a green-themed dessert as an opportunity to incorporate another healthy superfoods, veggies, or nutrients into your dessert. So what exactly do these bars taste like? They’re very sweet and will melt in your mouth. I was hesitant to name them “matcha bars” because I cannot taste the matcha green tea at all. They taste like a white chocolate filling layer on top of a chocolate brownie crust. The texture softens at room temperature to a soft pie or soft cheesecake consistency. For firmer bars, make sure to serve straight out of the fridge! You can add some peppermint extract to make these peppermint (or Thin Mint?!) flavored bars. I thought that was very fitting with the green color, but wanted to mix it up a bit! So green white chocolate flavoring it is. You can also drizzle some dark chocolate sauce on top. Overall, this is a delicious dessert and is sure to be a hit at your next potluck, gathering, or St. Patrick’s Day themed event you attend. Recipe below, let me know what you think! In a food processor or a Vitamix, blend walnuts, dates cacao powder and salt until well combined and mixture begins to stick together. Transfer to an 8×8 inch dish and press evenly to the bottom of the pan to form a crust. Soak cashews in filtered water for at least an hour. Strain and discard the water. Melt cacao butter in a saucepan over low heat. Blend cashews in a Vitamix or another high powered blender until smooth. Add cacao butter, maple syrup, and vanilla extract to the cashews and blend on high until well combined. Add matcha green tea to the cashew mixture and blend until the filling is an even green color. Pour the green tea mixture over the crust and tilt the pan to make sure the filling is evenly coating the crust. Let chill in the refrigerator for at least an hour. Cut into bars and serve! You an top with cacao power or drizzle with chocolate if desired. Makes 16 bars.